Besides captivating Ancient Greeks’ imagination that ultimately gave birth to Ancient Greek Mythology, Mount Olympus has also been the subject of scientific questioning since antiquity. Diffuse information point to increased interest for Mount Olympus herbs from Ancient Greeks as well as from Ancient Egyptians. 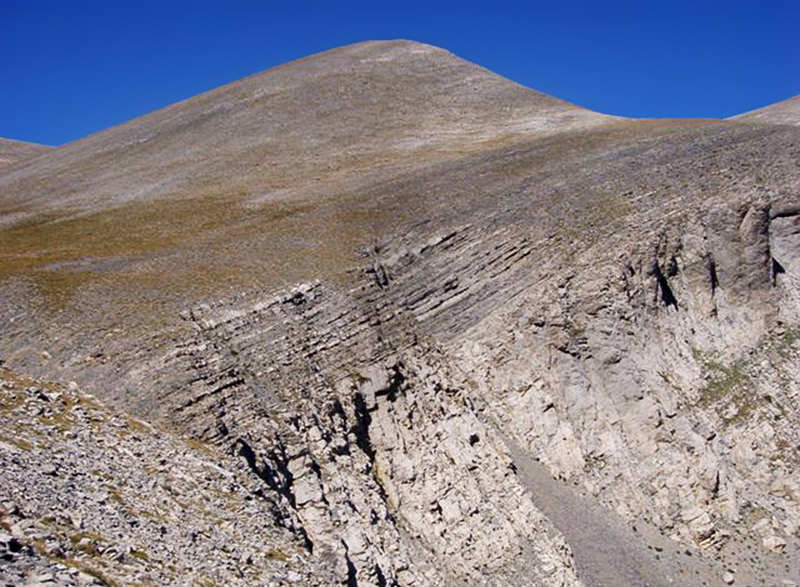 The first topographic mission concerning Mount Olympus is ascribed to geographer Xenagoras (1st century AD), whose estimates about the mountain’s elevation were not far from modern measurements. Next known cartographic reconnaissance was realized 17 centuries later by the British Navy in their overall attempt to construct the first maps of Greece. In AD 1831, British officer R. N. Coperland estimated the elevation of Mount Olympus at 2973m asl. Similar estimates are illustrated in other maps constructed during the 19th century AD (information is from Nikos Nezis book Olympus, edited from Hellenic Climbing & Mountaineering Federation, 2000, in Greek). During the same period (19th century AD), many botanists rushed on Mount Olympus to study its rich flora. In AD 1836, French researcher R. Aucher-Eloy visited Mount Olympus to collect herbs and in AD 1851 the first endemic species were recorded by German botanist Th. Heldreich. 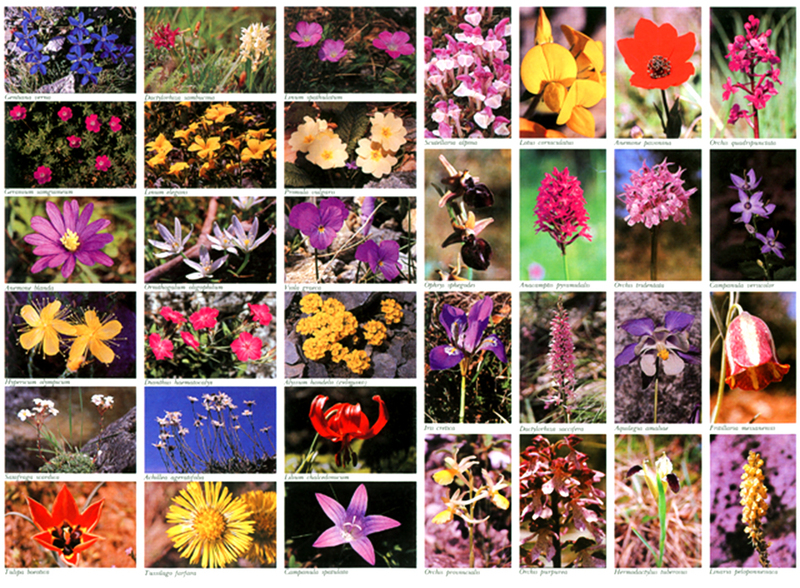 By the turn of the 20th century, research on Mount Olympus obtained a multidisciplinary color as many botanists, geologists and topographers set foot on its higher slopes to provide the first detailed scientific reports about flora, fauna and geology together with accurate elevation measurements of its highest peaks. In AD 1921, Swiss engineers Marcel Kurz and Hans Bickel employed stereophotogrametric methods and calculated the elevation of Mytikas (Pantheon) to be 2917.7m asl., while few years before (AD 1909) Yugoslav geologist J. Cvijic provided the first detailed reports of Mount Olympus geology. By late 20th century AD Mount Olympus saw a scientific climax as many international research projects concerning climate, geology and flora were realized. The construction of Agios Antonios meteorological station at 2815m asl. and the 16-year long (AD 1962 – 1978) NATO sponsored “Mount Olympus Cumulus Project” resulted in detailed studies about local climate. The 1970’s brought Danish researcher Arne Strid in Greece who realized exhaustive botanical studies that resulted in the publication of the book “Wild Flowers of Mount Olympus”. During the 1980’s Belgian geologist Anne Schmitt spent many years on Mount Olympus with her PhD study shedding new light on the geological evolution of the mountain and setting the basis for future research, while a National Geographic sponsored geological reconnaissance with Ohio State University researchers provided the first detailed accounts of the Quaternary glacial history of Mount Olympus. Recent scientific studies have focused on hydrology, water resources, pollen distribution, cave exploration and on past environmental changes. The latest scientific project occurring on Mount Olympus concerns the environmental change and glacial evolution of Mount Olympus during the Holocene (i.e. the last 10.000 years). 1. Neumayr M (1876) Das schiefergebirge der halbinsen Chalkidike und der Thessalischen Olymp. Jahrbuch Geolgischen Reishsansalt XXVI: 315–320. 2. Sintenis P (1890) Olymp. Oesterreische Botanische Zeitschrift. 3. Cvilic J (1908) Beobachtungen uber die Eiszeit auf der Balkanhanlbinsel U.S.W. und dem Misischen Olymp. Zeits. Fur Gletscherkunde, Berlin 2: 1–35. 4. Kurz M (1923) Le Mont Olympe (Thessalie). Paris/Neuchatel: Victor Attinger. 5. Hayek A (1928) Ein beitrag zur Kenntnis der vegetation und der flora des Thessalichen Olymp. Beihefte zum Botan. Zentralbalt XLV:220–328. 6. Koller O (1929) Das vorkommen von Rupicapra rupicapra auf dem berge Olymp (Griechenland). Mammol Mit. III Zool. Anz. 49. 7. Charworth-Musters JL (1932) A contribution to our knowledge of the mammals of Macedonia and Thessaly. Ann. Nat. Hist. 166–171. 8. Stojanov N and Jordanov D (1938) Botaniche studien auf dem Thessalischen Olymp. I. Floristische Ergebnisse (Jahrbuch Universitat Sofia Physicalish - Mathematische Fukultat) XXXIV-3 147–249. 9. Janssens E (1953) Un naturaliste chez les dieux. La Flambeau vol.5. 10. Quezel P (1965) Contribution a l’ etude de la Pinde central et septentrional et de l’ Olympe de Thessalie. Candolea v.20. 11. Godfriaux I (1968) Étude géologique de la région de l'Olympe. Annales Géologiques des Pays Helléniques, 19:1–284. 12. Barton CM (1975) Mount Olympus, Greece: new light on an old window. J. Geol. Soc. Lond. 131:389–396. 13. Barton CM (1976) The tectonic vector and emplacement age of an allochthonous basement slice in the Olympos area, N.E. Greece. Bull. Soc. Geol. France 18:253–258. 14. Faugères L (1977) Naissance et dévelopment du relief de l'Olympe (Grèce). Revue de Géographie Physique et de Géologie Dynamique 19(2):7–26. 15. Sahsamanoglou H (1977) Mount Olympus Massif as a lower troposphere heat source. PhD Thesis, Aristotle University of Thessaloniki, Greece. 16. Strid A (1980) Wild Flowers of Mount Olympus. Athens: Goulandris Natural History Museum. 17. Schmitt A (1983) Nouvelles contributions à l'étude géologique des Pieria, de l'Olympe, et de l'Ossa (Grèce du Nord) [Ph.D. dissert.]. Mons, Belgium, Faculté Polytechnique de Mons. 18. Psilovikos A (1984) Phenomena of river incision and terrace formation on the eastern foothills of Mt. Olympus, Greece. Revue de Géographie, Institute de Géographie Académ, Slovaque des Sciences Brataslava, 36:201–216. 19. Schermer ER (1990) Mechanisms of blueschist creation and preservation in an A-type subduction zone, Mount Olympos region, Greece. Geology 18:1130–1133. 20. Schermer ER, Lux DR and Burchfiel BC (1990) Temperature–time history of subducted crust, Mount Olympus region, Greece. Tectonics 9:1165–1195. 21. Schermer ER (1993) Geometry and kinematics of continental basement deformation during the Alpine orogeny, Mt. Olympos region, Greece. J. Struct. Geol. 15:571–591. 22. Stiros S, Arnold M, Laborel F, Pirazzoli P and Pomoni-Papaioannou F (1994) Late Quaternary uplift of the Olympus–Pelion Range coasts (Macedonia–Thessaly, Greece). Bull. Geol. Soc. Greece 30:325–330. 23. Pavlidis T and associates (1995). An evaluation of water resources of Enipeas River, Mount Olympus, Greece. Forestry Department, Aristotle University of Thessaloniki, Greece. 24. Smith GW, Nance RD and Genes AN (1997) Quaternary glacial history of Mount Olympus, Greece. Geological Society of American Bulletin 109: 809–824. 25. Smith GW, Nance RD and Genes AN (2006) Pleistocene glacial history of Mount Olympus, Greece: Neotectonic uplift, equilibrium line elevations, and implications for climatic change. Geological Society of America Special Papers 409: 157 - 174. 26. Nance RD (2010) Neogene-recent extension on the eastern flank of Mount Olympus, Greece. 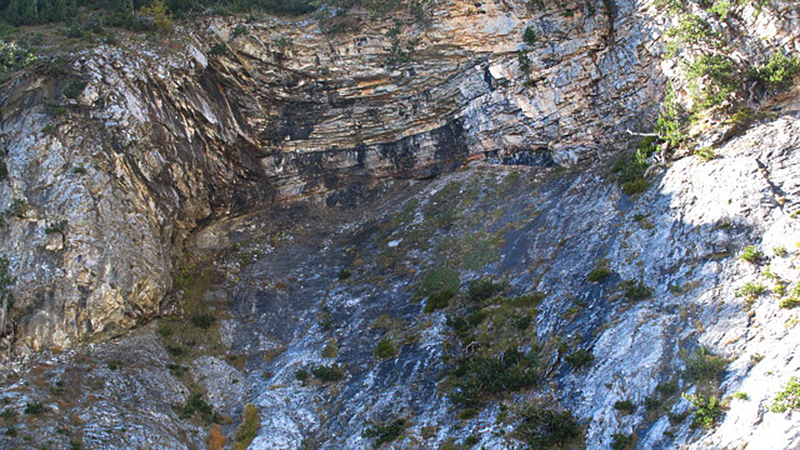 Tectonophysics 488: 282–292. 29. Klesse S, Ziehmer M, Rousakis G, Trouet V and Frank D (2014) Synoptic drivers of 400 years of summer temperature and precipitation variability on Mt. Olympus, Greece. Climate Dynamics DOI 10.1007/s00382-014-2313-3. 30. Styllas M, Schimmelpfennig I, Ghilardi M and Benedetti L (2015) Geomorphologic and paleoclimatic evidence of Holocene glaciation on Mount Olympus, Greece. The Holocene (doi: 10.1177/0959683615618259). Σίγουρα, ο Όλυμπος είχε δει την ανθρώπινη παρουσία πολύ πριν εμφανιστούν οι ορειβάτες. Παρ ολύμπιοι οικισμοί αναφέρονται από την νεολιθική εποχή (περίπου 7000 π.Χ.) σε διάφορες τοποθεσίες κατά μήκος της σημερινής Εθνικής Οδού (π.χ. Πηγή Αθηνάς), ενώ τα ψηλότερα τμήματα πιο κοντά στο βουνό, σχετικά άργησαν να δούνε την ανθρώπινη παρουσία, η οποίοι κατά την εποχή του Χαλκού (3000 – 1100 π.Χ.) γίνεται φανερή σε ενδιάμεσες θέσεις, όπως η Αρτέμιδος, η Κρανία (στην παραλία Παντελεήμονα), περιοχή Λειβήθρων, η Τοπόλιανη (ανάμεσα στην Άνω Λεπτοκαρυά και το Λιτόχωρο) και οι Σπάθες, όπως προκύπτει από το νεκροταφείο κοντά στον Αγ. Δημήτριο. Έκτοτε, η παρουσία των Θνητών που ανέβαιναν στον Όλυμπο για να ψάξουν τους Θεούς, τους οποίους οι ίδιοι είχαν βάλει εκεί πάνω, έγινε ολοένα και συχνότερη, με αποκορύφωμα τον τελευταίο αιώνα. Τα μονοπάτια που σήμερα χρησιμοποιούν πάν πολλοί ορειβάτες, αναρριχητές, δρομείς, περιηγητές και ερευνητές, για να ανέβουν στις ψηλότερες κορυφές, να σκαρφαλώσουν στις πιο δυσπρόσιτες ορθοπλαγιές, να πολεμήσουν το χρόνο και τον εαυτό τους, αλλά και για να ερευνήσουν το ιδιαίτερο φυσικό περιβάλλον του Ολύμπου, αποτελούσαν κάποτε τους βασικούς δρόμους για διαφορετικές δραστηριότητες, όπως για παράδειγμα το εμπόριο. "Η Ιστορία και η Λαογραφία του Ολύμπου μέσα από τα Περάσματά του. Ένας Άτλαντας για τον Όλυμπο και τα παλιά μονοπάτια του."